We have a number of amazing coaches who offer private tuition; there will be one to suit your needs! Below is a list of all coaches and just some of their accolades. If you would like to book in with a coach or enquire about pricing please contact us. Tibor is a very strong chess player who has a huge passion for chess and he thoroughly enjoys teaching children of all ages. 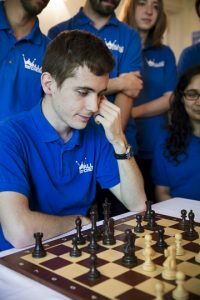 Nima is a popular coach who has got a lot of experience with playing and teaching chess and is great with children and he has studied child psychology at university. Tommaso is one of our strongest chess coaches and has a wealth of experience in teaching children and adults. Gabriel has competed in numerous tournaments as a child and along with his experience is also great with children. Peter is a natural with children and started playing chess at an early age. His biggest achievement was winning the national schools chess championship twice with his school team.